REPLACEMENT. THE ORIGINAL EVALUATION AND TREATMENT SHOULD HAVE ENSURED GOOD ABUTMENT SELECTION , CROWN PREPARATION WITH ADEQUATE MARGIN PLACEMENT, PONTIC DESIGN AND CORRECT OCCLUSION. NO GUARANTEE CAN BE GIVEN CONCERNING THE LONGEVITY OF ANY PROSTHESIS . PATIENTS SOMETIMES CAN PRESENT WITH ONE OF A NUMBER OF MAJOR PROBLEMS AFTER CROWNS OR FIXED PARTIAL DENTURES HAVE BEEN CEMENTED. One of the most common biologic failures. Pain or sensitivity to hot ,cold or sweet foods & liquids. Gold foil – filling material of choice for restoring marginal caries. Amalgam – best alterative to gold foil filling because ofits ability to produce long term marginal seal. Composite – indicated for restoration of caries in esthetic zone. Removal of prosthesis is required to obtain access to caries. If the lesion is small, the tooth preparation can be extended to eliminate the caries and a new prosthesis can be fabricated. 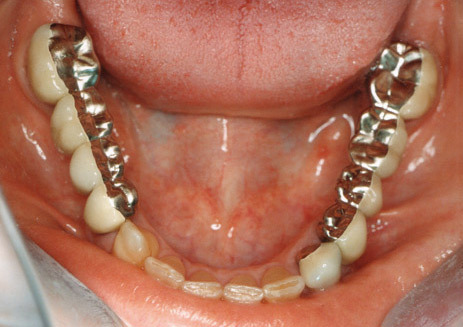 When the lesion is large, an amalgam restoration is often required. An extensive lesion may require endodontic treatment when pulp has been encroached. 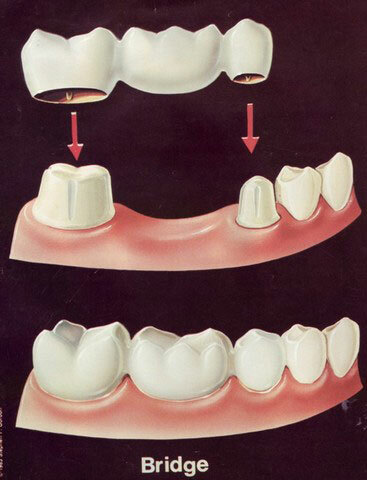 A grossly destroyed teeth by caries that cannot be restored must be extracted. Schwartz et al (1970) & Randow et al (1986) both reported caries to be the most frequent cause of failure of existing restorations (36% & 18.3%). Glantz et al .in 1993 reported that of 77 bridges reviewed at 15yrs , 32.5% required removal. Further reported in 1993 that the incidence of caries was not related to the age of the patient , rather , to the time that the bridge had functioned . pain – either spontaneous or related to hot or cold or sweet stimuli. Access preparation – a hole is drilled in the prosthesis through which the biomechanical preparation (BMP) is completed. If the retainer come loose during access opening or if the porcelain fractures, then remaking of the prosthesis may be necessary. A post and core restoration should be considered if little sound tooth structure is remaining. Survival of endodontically treated , post-restored teeth depends on a multitude of factors , all of which are practically impossible to include in a randomized , controlled clinical study. Fracture of the tooth was the most common type of failure among the failed post-retained restorations followed by loosening of the post & fracture . Tapered posts more often displayed fracture of the tooth and less often fracture of the post. Fracture of the post was more common among male patients than among female patients. Periodontal disease can produce extensive bone loss , which in course of time results in the loss of abutment teeth and attached prosthesis. A pontic that contacts too large an area on the edentulous ridge. A prosthesis with rough surfaces which promote plaque accumulation. Devitalized & severe bone lossà Endodontic procedure/ bicuspidization hemisection of teeth. Less severe breakdown can be treated without fear of loss of teeth, with small surgery which may produce an unacceptablerelationship between prothesis & the soft tissue. Patients may be uncomfortable with their new occlusions. in the range of 10-15 microns. When detected early occlusal adjustment should be done to eliminate these interferences without permanent damage. Occasionally, a combination of excessive mobility and reduced bone support require extraction of abutment teeth. Irreversible pulpal damage requires endodontic treatment. VD may be decreased as a result of severe attrition or increased as a result of poor restorative planning. internal derrangement into a symptomatic one.àalteration in muscle activity can cause “myalgia”. Teeth can become sensitive either due to loss of occlusal tissue or due to trauma to the teeth from the increased VD. Clenching of teeth because of premature contact. Loss of posterior vertical dimension à lower anterior teeth occluding more heavily with the palatal surface of the upper anterior teeth causing drifting or failure of anterior restorations. Decrease in the VD can result in occluding of the lower incisors with the palatal soft tissues giving rise to soreness & possible periodontal complications. Speech problems particularly with sibilants. Improperly located pinholes or pins used in conjunction with pin-retained restorations may perforate the tooth laterally. Management : depends on the location of the perforation. Extend the preparation to cover the defect. lead to extraction of the tooth.